There will be less craning and straining in the name of patriotism when the Bobcats play on the renovated Garcelon Field. At the old grandstand, now just a memory, the flagpoles were atop the press box behind the spectators. So anybody who wanted to gaze at Old Glory during the national anthem had to twist right around to see it. Posts for the scoreboard were set on July 28, Gustin says, part of a slew of perimeter work. Workers are setting posts for the fence around the playing field, which involves drilling into the concrete anchor curb that was laid the other week. The fence itself won’t be set up for a few weeks. They’re also roughing in the electrical conduits for the facility, which will feed receptacles, the press box, a few wireless-Internet nodes and the big Musco field lights. Speaking of those four Musco light towers — similar to the Musco lights at the Campus Avenue Field — they will show up at the worksite in the early days of August, though it’s not clear when they will be erected. Two of the four towers will flank the grandstand and the other two will stand on the west side. Each tower will be 80 feet tall and hold 18 individual lamps. How much will it cost to run the lights? We turned to Gustin’s colleague Paul Farnsworth, who tracks electrical use for the College, with that question. operated at partial or full power, according to need, but at full power they’ll burn through a total of 112.6 kilowatts per hour, Farnsworth explains. Campus Construction Update, who doesn’t get out much, was surprised to learn that the actual operation of the lights will largely be controlled away from campus — from Musco’s Control-Link Central operation at the home office in Oskaloosa, Iowa. While Bates can turn the lights on and off locally, we can also use the Web, e-mail, phone or fax to submit a lighting schedule in advance — and then sit back and watch night turn to day. Musco, says Gustin, is “the best game in town,” no pun intended. “They’re like the Cadillac” of large-scale lighting. Progress on the playing field itself, meanwhile, is right where it should be, says Gustin. 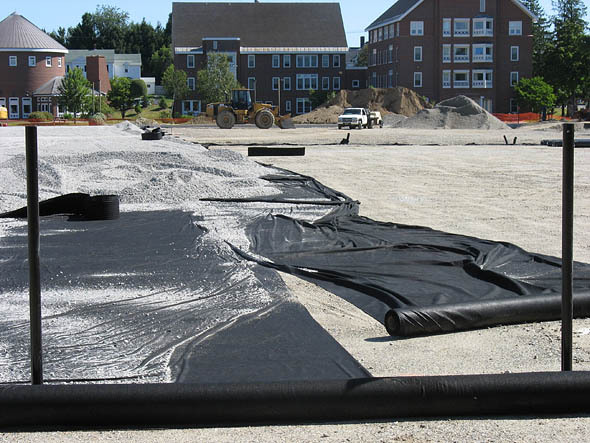 Workers are about halfway through the laying of flat drain pipes, a textile layer and gravel, and will be done by the first few days of August. They’ll start laying the FieldTurf playing surface — the “carpet,” as the installers call it — around Aug. 9. Read this week’s news from the renovation of Hedge and Roger Williams halls.